Minnesota, one of the Midwestern states of the United States of America, is bounded on the north by Canada, east by Lake Superior and Wisconsin, south by Iowa, and west by the Dakotas. The chief towns are Minneapolis and the adjoining capital St. Paul. The state is known as the land of 10,000 lakes. Mining and lumbering are among its industries, but the state is noted largely for its prosperous agriculture. Minnesota was the 32nd state to join the Union on 11 May 1858. The area of the state is 87,014 square miles (225,365 km²) and the 2008 estimated population was 5,220,393. In 2006 the state's racial composition was as follows: 87.3% White (non-Hispanic); 4.4% Black (non-Hispanic); 3.8% Hispanic, a category that includes people of many races; 3.4% Asian/Pacific Islander; 1% Native American/Alaskan Native; 1.6% mixed race; and 1.6% other races. In 2001 the religious affiliation of people in Minnesota was as follows: Roman Catholic - 25%; Lutheran - 24%; No Religion - 14%; Other Christian - 7%; Baptist - 5%; Methodist - 4%; Assemblies of God - 2%; Church of God - 2%; Other - 2%; Presbyterian - 2%; Other Protestant - 1%; Pentecostal - 1%; Episcopalian/Anglican - 1%; Jewish - 1%; Non-Denominational - 1%; Congregational/UCC - 1%; Jehovah's Witness - 1%; Refused to Answer - 6%. The first Mennonite settlers in Minnesota came in 1873 from the Crimea, Russia, into the Village of Mountain Lake, in the southern part of the state, which was hardly more than a railway station then. Other groups, all of Dutch-Prussian-Russian background, came in succeeding years; by 1880 some 350 families had come to this Cottonwood County village, which became the center of a large Mennonite community. Some of these families made their homes in the village and set up places of business, but most took up neighboring farm lands. A few families chose more outlying districts but later came back. Leaders in the early years were the four pioneer elders, Aaron Wall, Heinrich Voth, Gerhard Neufeld, and Heinrich H. Regier. Other personalities of note were Jacob J. Balzer, I. I. Bargen, and John Rempel, who were instrumental in organizing school and church life. A smaller contingent of Mennonites came to Butterfield, in Watonwan County, the county east of Cottonwood, in 1880-1883. This group, of Galician (Swiss) origin, came from the Lemberg area in Austria. A few families of this group located in outlying districts, but only temporarily. Most of these people lived in or near Butterfield. The Butterfield and Mountain Lake area was really one community. Through the years a number of families drifted away to western states, and some to the cities, but many came back. The majority of the Mennonites in this locality were prosperous farmers, but a goodly number set up flourishing business establishments. Some went into professions, such as medicine, nursing, teaching, and the ministry. A small group of Mennonites lived at Warroad, a town of about 1,500, in Roseau County in northwestern Minnesota, since 1934. Most of this group came originally from the Mountain Lake and Butterfield area. They left Minnesota in 1916 and settled near Lostwood, in northwestern North Dakota, but because of continued crop failures moved to Warroad. Their number was increased by some families from Alsen and Munich, ND, and others coming direct from the Mountain Lake and Butterfield community. They were all of Dutch-Prussian-Russian background. A congregation (General Conference Mennonite) was organized in 1939 and a country church was built. Its membership in 1954 was 86. The first Mennonite church in the Mountain Lake community, later called Gospel Mennonite Church, was organized in 1876, and was open to all who wished to affiliate with it. In 1888 a split occurred, due to the introduction of Sunday school. A small group in the congregation led by Aaron Wall severed its connection and reorganized as a separate congregation, which later was instrumental in forming the Evangelical Mennonite Brethren Conference. The original church became a member of the General Conference and the Northern District Conference. A third branch of Mennonites represented in the community were the Mennonite Brethren. The first Mennonite Brethren church was organized in 1877. The following data indicate the constituency of these conferences in Minnesota in 1954; General Conference Mennonite with a membership of 1,822 in 7 churches, including the church at Warroad; Mennonite Brethren with 452 members in 2 churches; and the Evangelical Mennonite Brethren with 255 members in one congregation. The last migration of Mennonites into Minnesota was that of the Mennonite Church (MC). One group came from Cullom, Illinois, to settle in 1894-1897 at Alpha, in Jackson County, on the Iowa border some 20 miles straight south of Mountain Lake. This congregation had 77 members in 1954. The next congregation of this branch was Lake Region at Detroit Lakes, 180 miles northwest of Minneapolis, founded in 1926, most of the members coming from Nebraska. In 1954 it had 87 members. A series of seven mission churches have been established by this branch in the 1940s-1950s in northern Minnesota (Cass Lake 26 members, Ogema 51, Queeton 15, Leader 26, Loman 20, Menahga 26, International alls 50). The total membership in these missions was 214. Thus the total membership of the Mennonite Church (MC) in Minnesota in 1954 was 378. The largest concentration of Mennonites in Minnesota was in the Mountain Lake area in the southwestern part of the state. Congregations are also found in northern Minnesota and one congregation is located in southeastern Minnesota. Mennonite groups in Minnesota included the General Conference Mennonite Church (GCM; 7 congregations), Mennonite Church (MC; (5 congregations), Mennonite Brethren (3 congregations), Conservative Mennonite Conference (3 congregations) Evangelical Mennonite Brethren (Fellowship of Evangelical Bible Churches; 2 congregations), and Mid-West Mennonite Fellowship (2 congregations). Faith Church in Minneapolis was affiliated with both the General Conference Mennonite Church and the Mennonite Church (MC). Total membership in 1986 was 2,693 of which 1,610 belong to General Conference congregations. Approximately 50 Amish families from Ohio moved to Fillmore County in southeast Minnesota in 1974. Beachy Amish Mennonites also came in the 1970s, settling in two communities in central Minnesota. In 1954 the Mennonite Brethren began a church in Minneapolis, moving in 1964 to the suburb of New Hope. General Conference (GCM) people in Minneapolis, who had been worshiping with the Mennonite Brethren, began their own fellowship in 1960 (Faith Church). A General Conference congregation begun in Mankato in 1979 was disbanded in 1985. Another church planting effort began in Duluth in 1984 (sponsored by the Northern District of the General Conference Mennonite Church). General Conference Mennonites and the Mennonite Church (MC) have combined to plant churches in St. Paul (1984) and Moorhead (1986). The Mennonite Church (MC) began church work in International Falls in 1969. Minneapolis has been the site of several large Mennonite gatherings including Probe '72 the General Conference special sessions on civil responsibility in 1979, and the United States Conference of the Mennonite Brethren in 1980. ARDA: Association of Religion Data Archives. "State Membership Report: Minnesota, Denominational Groups, 2000." http://www.thearda.com/mapsReports/reports/state/27_2000.asp (accessed 21 March 2009). Graduate Center of the City University of New York. "American Religious Identification Survey 2001." http://www.gc.cuny.edu/faculty/research_briefs/aris.pdf (accessed 21 March 2009). Hege, Christian and Christian Neff. Mennonitisches Lexikon, 4 vols. Frankfurt & Weierhof: Hege; Karlsruhe: Schneider, 1913-1967: v. III, 139. Horsch, James E., ed. Mennonite Yearbook and Directory. Scottdale: Mennonite Publishing House(1986-87): 30, 99. Minutes and Reports, North­ern District (GCM; 1986): 45-46. Jubiläumsfeier zum Andenken an das 50-jährige Bestehen der Mennonitenansiedlung von Mountain Lake, Minnesota 1875-1925. N.p., n.d.
Mennonite Brethren General Conference Yearbook (1984). Rempel, G. S. A Historical Sketch of the Churches of the Evangelical Mennonite Brethren. Rosthern, SK, 1939. Schultz, F. S. A History of the Settlement of German Mennonites from Russia at Mountain Lake, Minnesota. Minneapolis, 1938. Wikipedia. "Minnesota." http://en.wikipedia.org/wiki/Minnesota (accessed 21 March 2009). Wittlinger, Carlton O. Quest for Piety and Obedience: The Story of the Brethren in Christ. Nappanee, IN: Evangel Press, 1978: 147. Friesen, J. John and Myron D. Schrag. 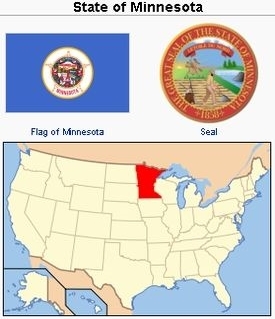 "Minnesota (USA)." Global Anabaptist Mennonite Encyclopedia Online. March 2009. Web. 18 Apr 2019. http://gameo.org/index.php?title=Minnesota_(USA)&oldid=145889. Friesen, J. John and Myron D. Schrag. (March 2009). Minnesota (USA). Global Anabaptist Mennonite Encyclopedia Online. Retrieved 18 April 2019, from http://gameo.org/index.php?title=Minnesota_(USA)&oldid=145889. Adapted by permission of Herald Press, Harrisonburg, Virginia, from Mennonite Encyclopedia, Vol. 3, pp. 707-708; vol. 5, pp. 589-590. All rights reserved. This page was last modified on 16 January 2017, at 00:53.